Institut Congolais pour la Conservation de la Nature (ICCN) is the governmental agency that oversees Congo's protected areas. The Bukavu office oversees operation of Kahuzi-Biega National Park, a World Heritage Site and one of Congo's more accessible national parks. The park's headquarters at Tshivanga lies to the northwest on the road from Bukavu, which also goes to CRSN, Lwiro. In addition, the ICCN offices in Bukavu have jurisdiction over the Itombwe Massif, which, despite containing the largest remaining uninterrupted forest block of the Albertine Rift, has no official protected designation. The Field Museum’s collaboration with ICCN has been focused on Kahuzi-Biega National Park, which lies to the west of Lake Kivu. This park, which was designated as a World Heritage site in 1997, is comprised two parts: a highland area encompassing the montane forests around Mt. Kahuzi and Mt. Biega and a much larger lowland region that protects forest in the upper reaches on the Congo Basin. 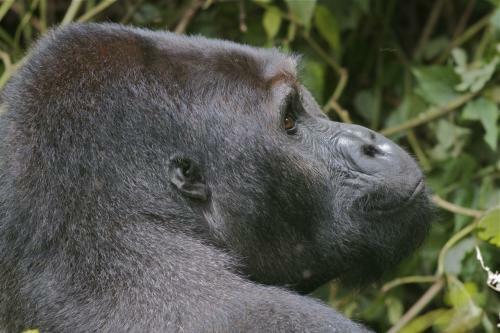 The highland section of the park near Tshivanga contains two habituated troops of gorillas; gorilla tracking is available to tourists who visit. The park also has populations of forest elephant, forest buffalo, and chimpanzees, although seeing these animals is much more difficult than the gorillas and takes a considerable amount of luck. The lowland portions of the park were added in 1975, and the total area of the park is now 6,000 sq. km (over 2,300 sq. miles). However, despite formal recognition as a national park, much of the park lacks true protection due to insecurity. Chimanuka is the silverback--the leader--of one of the habituated troops of gorillas in the highland sector of Kahuzi-Biega National Park. This photo of him was taken in 2012, when he was 26 years old. Photo © Josh Engel/The Field Museum..